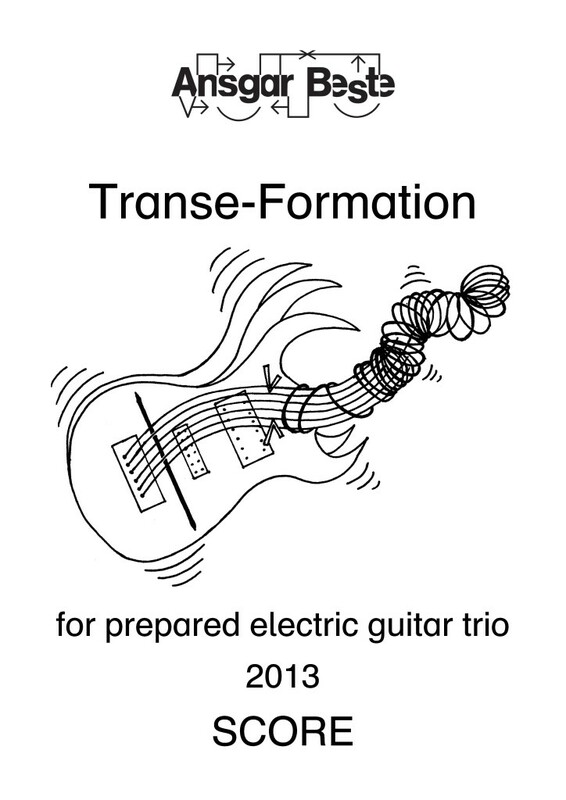 Setting Prepared electric guitar trio. Period of creation 2013-08-13 to 2014-01-12. Commission / occasion Commissioned by the en­semble KROCK (Swe), funded by Statens kulturråd (The Swedish Arts Coun­cil) (Swe). On the one part, a gradual induction of the (psycho-physiological) mental state of trance, a hypnotic, dazed, semi-conscious state, somewhere between sleeping and waking, is musically projected: Rhythmic cells and complex metric principles from other musical genres, particularly from progressive metal, are fused into an irregularly polymetric and polyrhythmic network. The emerging contrapuntal structure is intended as a sophisticated, faint allusion to (electronic) dance music, where the monotonous ostinato of repetitive rhythms aims at a hypnotic effect. At the same time, the timbral development is playing a leading role in the transition of the consciousness: Relatively dry single attacks, allowing for clearly audible rhythms at the beginning of the work, are transformed, via the intermediate stages of granular attacks and repetitive attacks of al ni­en­­te rat­tling, finally to continuous but fluctuating sounds (with hypnotic quality?). This progression causes the articulated rhythms to become increasingly blurred and difficult to discriminate. The resulting change in the perception or perceptibility of rhythmic information (through timbral mutation) might be interpreted (or emotionally comprehended) as the formation of trance. On the other part, the work deals with the transformation of the guitar instruments and their treatment: Firstly, different preparation setups in the course of the piece successively alienate the sound of the instruments and their acoustic recognizability. Secondly, the positions of the instruments in the guitarists’ hands are altered from normal to lap to upside down position. Thirdly, the applied playing techniques are converted from conventionally plucking the guitar strings to a mixture of plucking, striking, bowing and rolling the preparation objects attached to the strings. The overall form can be regarded as a large-scale, 12-minute canon in three voices with different and fluctuating trans(e)formational speeds. Guitar 2 is acting as “dux”, characterized by a rather stable transformational speed compared to its two opponents: Guitar 1 (“comes 1”) is rushing through the initial stages of the development and considerably decelerating towards the end, whereas guitar 3 (“comes 2”) is starting at creep speed and remarkably accelerating during the final stages. Consequently, apart from the very first and last bars, the 3 players are almost permanently facing each other in a dialectical situation of antagonistic rhythms, metres, timbres and instrumental treatments, hinting at the complexity of internal and external struggle a trans(e)formational process might be undergoing. 71,43% Selection for the Reading Session Wiek Hijmans at the festival Gaudeamus Muziekweek in Ut­recht (Ned), 5/7 (2016-08) [3 min solo version].